This newly renovated, 4-star hotel is right by the superb Playa d’en Bossa beach, 4 km from Ibiza town and within walking distance of the island’s best bars and clubs. The hotel’s recent refurbishment has been recognised with its upgrade to 4-star status, and it is now one of the few hotels in the area to have reached these high standards. The hotel features spacious, comfortable, modern rooms and bright, airy public areas. 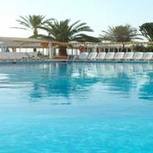 The impressive facilities include a pool bar, a chill-out bar and restaurant in front of the beach, a disco, a tennis court, a supermarket, a souvenir shop and parking for guests. 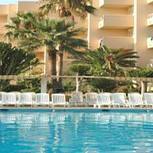 With great facilities, comfortable, high standard, 4-star accommodation and a great location close to one of Ibiza’s best beaches and within easy reach of all that the island has to offer, the hotel is a great choice for a holiday in Ibiza. 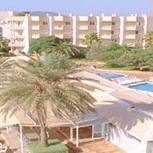 The hotel has 298 double/twin rooms that can accommodate 2 or 3 people. All of the rooms are fully-equipped with modern facilities and a balcony with a side sea view.